I’m certainly no expert on the Google App Engine (which is why I read this book), so after fiddling around with it for a couple of my iOS projects and struggling to decipher the documentation of some of the more complex parts of the Engine, I was glad to get my hands on this book. It’s not that the App Engine docs are that bad, in fact the Getting Started section was very helpful and did get me started very quickly, it’s just that they are clearly written as technical docs. I’m not your standard software developer, and sometimes I need things laid out nicely and fed to me on a big soup spoon. And Programming Google App Engine is my spoonish saviour. The book is well organized, and is distinct from some other books I’ve read for it’s conciseness and lack of filler content. The code examples are very brief, yet each demonstrates clearly the concept being discussed, so there is not much code reading to do in this book. 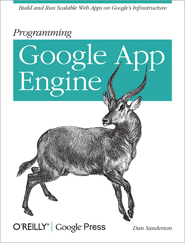 On the other hand, this is certainly no cookbook or even a guide to writing an app engine app. What it is, is a thorough walk-through of the App Engine’s features, with several useful explanations of some of the unexpected and subtle complexities that would likely ensnare an unwary developer. He also points out many areas where Google’s implementation differs from what one would expect coming from a relational database background. These were all features I didn’t even know existed before I read the book, and my knowledge and understanding of them will go a long way to helping me write more sophisticated and powerful App Engine apps. The chapters on the Memory Cache and Task Queues were also particularly interesting and useful. I should confess that my interest in the Google App Engine is purely from the perspective of the Python language, so I skipped all of the sections and chapters related to Java. It does seem that the App Engine has been designed with Python in mind and there are many features available for Python that are not yet available for users of Java, and the book reflects this in its seeming emphasis on Python. Apparently, the book is already dated because the Google App Engine is being updated all the time, but that doesn’t bother me because the book and the documentation serve distinct roles. The book gives you a “story” of what all the pieces are and how they fit together. When I run into a situation where the book’s information is dated, then I’ll refer to the current documentation to get the more up-to-date details. I don’t think the fact that this book is *gasp* 15 months old should be a deterrent from picking it up. I actually read the book through my subscription to the O’Reilly Safari Books Online site, but I think it will be such a valuable reference that I’ve just ordered a print copy – and I don’t kill trees very often these days, so that says something about the book!